*Please note: All products are subject to shipping and handling charges. 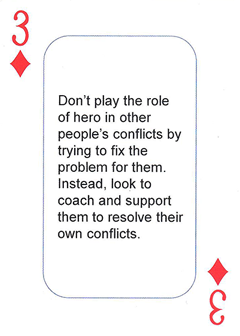 I recently partnered with internationally renowned interactive trainer, Thiagi, to develop a "Conflict Management" set as part of his "Practical Advice Card" series. In addition to the deck of cards, you will receive a booklet containing 12 training games that can be played with the cards - all designed to stimulate discussion and reflection. This is a wonderful resource for anyone who teaches conflict resolution. To purchase, please go to the Thiagi Website. 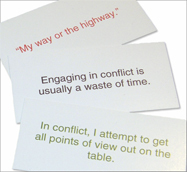 "I have used (and continue to use) the Conflict Style Cards during my Negotiating Effectively course with great success. These cards provided participants a visual and hands-on experience and provided realism in an energetic yet humorous exercise setting." — Court Stevens, DC Stevens Consulting Group Inc.
"The Conflict Style Card Exercise was very effective; a great opener that got everyone involved." "The Conflict Style Cards set is the most effective tool for engaging participants in discovering their own personal conflict management styles and those of others. Participants really enjoy the change of pace, interaction and learning from each other." All images and content copyright 2003-2005 Harper & Associates.